Summary (from the inside flap): Five months ago, Valerie Leftman's boyfriend, Nick, opened fire on their school cafeteria. Shot trying to stop him, Valerie inadvertently saved the life of a classmate, but was implicated because of the list she helped create. A list of people and things she and Nick hated. The list he used to pick his targets. Now, after a summer of seclusion, Val is forced to confront her guilt as she returns to school to complete her senior year. Haunted by the memory of the boyfriend she still loves and navigating rocky relationships with her family, former friends, and the girl whose life she saved, Val must come to grips with the tragedy that took place and her role in it, in order to make amends and move on with her life. 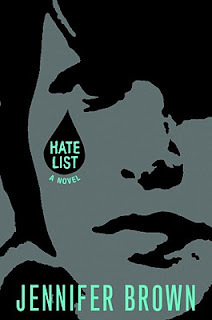 Review: To say that I "enjoyed" a book about a hate list and a school shooting seems like the wrong word choice. But I am not sure what word to use instead. This book is well written, powerful, thought-provoking, and important. Jennifer Brown has taken a topic that, unfortunately, has been all too real for many schools in this country, a school shooting, and has looked at it from all sides. The reader hears from victims, an unwitting collaborator, parents, friends, the administration, and even the media as Brown moves between pre- and post- event to tell Valerie's story. The characters are believable and Brown deftly shows that no one person is correct in their behavior; we all have good and bad intentions within us, it's what we do with those feelings that matters. I also liked that the book wasn't preachy; it didn't suggest that if one person had reached out to Nick (the shooter) the shooting wouldn't have happened. Nick also isn't portrayed as a wholly horrible person. And, the ending, while upbeat, is also realistic and not fairy tale; most characters are beginning to move on with their lives, but not all are happy or well-adjusted. That's reality. I finished this book while waiting for my dentist appointment and found myself almost asking the assistant what she thought of the incident, then realized it was a book I had read, not a real event! That shows how under my skin this book got. What book has tricked you into believing, even for a moment, that it was real and not just a book you were reading?